Meadow Branch Cottage is nestled among the trees and has a spectacular view of the entire farm. 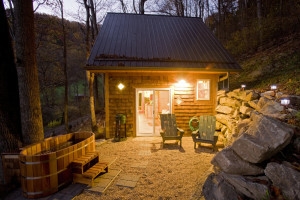 Relax in the cedar hot tub on the patio with a picturesque view of the mountains, farm and treeline. This quaint cedar shake cottage is the perfect quiet sanctuary for couples. Stephen and I designed the cottage from scratch and enlisted several friends with the building process. We started building in January 2009 and the cottage was not completed until November of that year. We took our time and paid close attention to every detail from the copper countertops in the kitchen to artistically placed blue art block in the walls. Starting with the outside, the grading and landscaping was done by CLS which is owned by our friend, Chad Bradley. Dawn’s father donated the cedar shakes used on the outside of the cottage which were salvaged from a previous construction job. In the kitchen and bathroom, Stephen and Tom installed handmade copper countertops that now have a beautiful patina. The whimsical rebar railings for the stairway and loft were Stephen’s idea. The terracotta concrete pad on the first floor has intricate artistic patterns cut in the living room, bathroom and kitchen. Blue art block was installed and adds a wonderful light affect for the living room. In the wall between the bathroom and kitchen is an antique stained glass window that adds both light and color. Stephen and I collected items from various antique stores and thrift stores for one year before completion. We were able to find a Viking cook-top stove and most of the plumbing materials from Habitat for Humanity. New Directions, our neighbor, made the wormy chestnut bookshelf, kitchen table and outdoor Adirondack furniture. At Fiddlesticks in Mars Hill, a great antique store, we found lots of items to decorate the cottage along with the two red kitchen chairs and the stained glass window. The kitchen is complimented with handmade pottery dishes. The patio is the most amazing part of the cottage as the view is of the entire farm. The breathtaking view is enjoyable from the cedar Japanese Ofuru soaking tub nestled on the edge of the patio underneath the canopy of a large poplar tree. The cedar tub is large enough to sit two persons comfortably and is set to a perfect 100 degrees. We use no chemicals in the tub, so you can enjoy a nice quiet cedar aromatherapy soak. Step back into this simple but modern way of life.